(Host) A stream in Northfield will soon run free for the first time in seven decades. 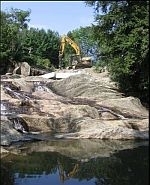 A construction crew this week is removing an old concrete dam from Cox Brook, a tributary of the Dog River. The project eliminates a safety hazard caused by the aging dam, and it will open up miles of spawning habitat for wild trout. (Dillon) Heavy equipment operator Mark Breer uses his giant steel hammer like a delicate paring knife. With a few well aimed blows, he deftly slices the concrete dam away from the bedrock. Next to his excavator, Cox Brook is already flowing free on its way to the Dog River. Trout fishermen – and a nearby neighbor – are celebrating. (Bathory-Kitsz) "We’ve been living with this dam looming over top of us for decades. And gradually slowly but surely we’ve been seeing it crack up." (Dillon) That’s Dennis Bathory-Kitsz, who lives directly below the Cox Brook dam. He said the structure was beginning to crumble. And this summer’s huge storms made him nervous. (Bathory-Kitsz) "The possibility of the dam breaching or the possibility of protective rock that we have there as a vertical structure failing has been increasing over the years …. So we didn’t want to have a living room full of water or concrete." (Dillon) The dam was built in 1932 – apparently for a saw mill that was never completed. It doesn’t generate power, and the concrete wall blocked trout from the Dog River from reaching several miles of spawning habitat. As Bathory-Kitsz warily watched the structure fall apart, fisheries biologists and environmentalists saw a stream that could be restored. (Amadon) "I mean this is really exciting. I can count on maybe one hand the dam removals that are going on in the U-S this year…"
(Dillon) Clark Amadon is president of the Mad-Dog chapter of Trout Unlimited, a group that protects fish habitat. He says the project is unusual because once a dam goes up, they’re hard to take down. (Amadon) "From the time pretty much when this was first settled, dams were put up everywhere with no sense that this was a system that really needed to be a system and not cut up and reconnecting it and restoring these runs and rivers it’s really, really crucial work that needs to be done". (Dillon) The Dog River is one of very few Vermont streams that are not stocked with fish raised in a hatchery. The big brown trout, the colorful brook trout and the rainbows here are all wild and they need clean, running water to spawn. The U.S. Fish and Wildlife Service is paying for much of the work under a program designed to restore stream habitat. Madeline Lyttle is a biologist with the federal agency. (Lyttle) "Certainly the Dog River has a very unique, very lucrative fishery, so re-connecting it with these tribs is very important. This is a good project, I feel very happy about it." (Dillon) Lyttle says everyone involved in the project has taken care to protect the stream. (Lyttle) "These equipment operators have been rescuing fish in their hard hats. It’s been great watching them. They’ll see a fish in a pond, the fish can’t get out of the way, and they’ll jump out of their equipment, and they’ll scoop them up in their hard hats and gingerly put them down river. Everybody cares about the fish. It’s great." (Dillon) Lyttle says trout are already trying to move upstream. The final pieces of the dam will come out this week. For VPR News, I’m John Dillon in Northfield Falls.